It seems we may have turned the corner into Spring, although the forecast is meant to drop in the UK this weekend. Isn't it a relief more light is coming? Aren't you ready for more light & warmth?! On Monday morning, I was cutting some greenery at Milestone for a floral arrangement and I noticed some new weeds coming through. Since I was wearing gloves anyway, of course, I had to (compulsively) pull them out. Then I saw some more...and some more....and pulled and pulled. 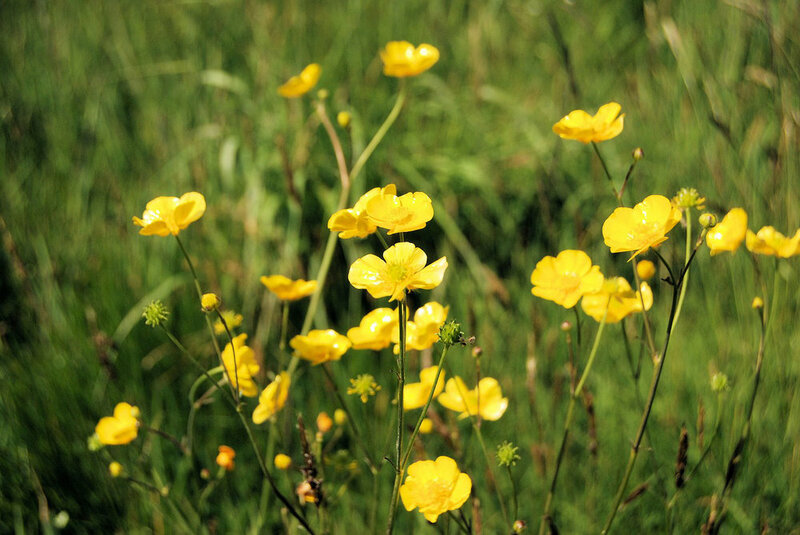 The creeping buttercup spreads itself around, as it suggests, with deep creeping roots as well as throwing its seeds about. [It's a shame it's toxic or it'd end up in the juicer!] The new roots looked like greedy fists grabbing the soil but because the ground is so soft, they came out easily. It's been a while since I was out weeding but it reminded me of how much I've always loved to weed in the rain because when the soil is so soft, the weeds simply surrender and, as the perennials are died back, are easy to spot. Bad habits are like weeds. They take hold in ideal conditions and stealthily feed on what is good, putting down stronger and stronger roots when it's all so easy. One day, we notice something having the wrong place in our lives, and when we go to pull it out with the will of our bare hands, it doesn't surrender so easily. This is my special American shovel. It has a sharp cutting edge at the bottom which makes light work of digging in UNDER a plant to get it up. With the right tool(s), ANY habit can be broken, most things can be mended, beauty can be restored. For some issues, the tool required is a new way of thinking - as I introduced to you in January with Annie Grace's liminal thinking approach to kicking the alcohol thing, see more here. For other issues, it's education and skills. That's what we're about at The Milestone Detox. Weeding, then sowing. Since we're small, we're able to help our clients in a direct way - suggesting the right tools for the right job. We preach 'Flexitarianism' and stay away from dogmatic labels as much as we can. We're connected to a wide team of experts and natural health professionals to whom we refer, we stay up-to-date with the latest research in healing technologies and I, particularly, have a passion for teaching you all things foodey. As an example, here is a little Spring gift for you - unique and informative. I hope you enjoy it!